Why monitor your database yourself? As a business leader you have a lot to think about. Instead of designing and implementing your own database monitoring procedures, why not call in the experts at SQLTreeo? Our comprehensive monitoring tool gives you complete peace of mind and means you can focus on doing what you do best – managing and growing your business. And don't forget, our Database Administrators (DBAs) can help you solve any problem. 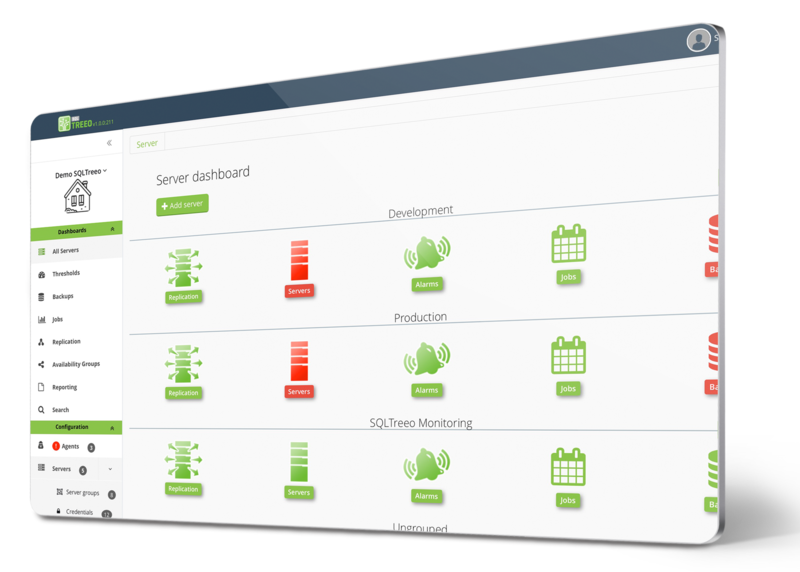 Get instant alerts of any errors or issues in your SQL environment by email, dashboard notification, phone and integrated applications. Take control of your replication configuration. Our graphs and easy to understand symbols and colours show publisher, distributor, and subscriber connections, data transfer and potential issues. Our history charts show detailed information at whatever level you need. The most important data is shown on your dashboard so you don’t need to check different screens. You can also click on the bar charts to drill down into more detail. You can even export historical data to create custom reports that identify trends and potential improvements. We can produce SQL Server reports in all popular formats including HTML, PDF, XML, MHTML, Excel or Word. We can also provide export reports based on data gathered from your environment. These can improve capacity planning and historical and current issue and trend analysis. Our report icons change colour to alert you to database errors. You can also drill down into more detailed information. The alarm dashboard gives a comprehensive view of the incidence of specific alerts on each server and database in the past week, month or year. Each graph and chart is drillable to the level of detail you want. For example, you can simply click through to understand when a backup was made, how long it took, its size and location. The built-in chat function allows you to talk with everyone in your SQL environment securely, wherever you are. You can even create multiple environments for different servers. Each has its own integrated chat that lets you assign and discuss tasks with other logged-in users in their browser. 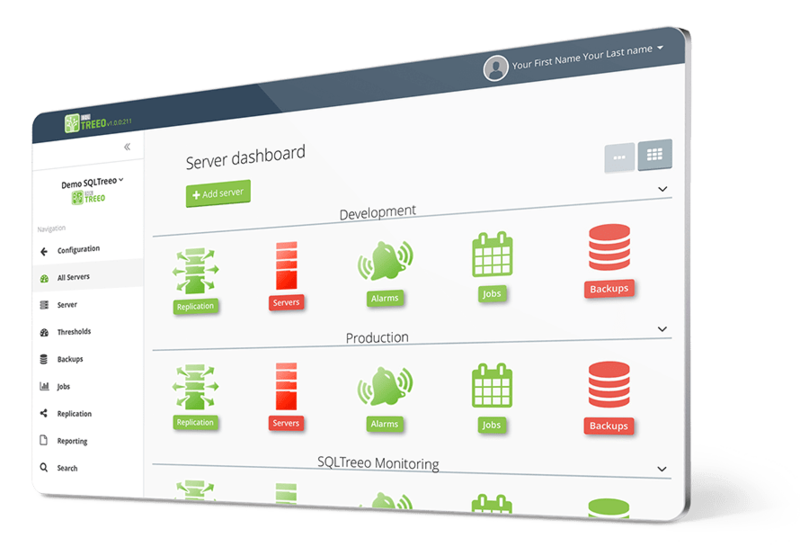 You can set up SQLTreeo’s database monitoring system in just three easy steps - download the monitoring software, install the service and add the servers. You can then add unlimited users with assigned roles. We have pricing packages to suit all needs. You can change yours anytime. Take 3 easy steps to start your monitoring as soon as possible – download our monitoring software, install the service and add your servers.